After you have created a Indeni user for the device you want to add, (1) click on Credential Sets. Once you do, (2) it would be good to name it immediately because once you click out of it, it will save the name as is. If that should happen, simply select the credential set you want to rename and (3) click Edit, and you should be able to rename it. After you have added the Set name in the List, you should then add the device credentials by clicking on New, which can be found in 3 places. After you have added the credentials, and the connection type, add the subnet you want to associate with the credentials. Please Note: If you have created the same Indeni credential across all device vendors you want to add to the system, we recommend using 0.0.0.0/0 subnet with SSH + HTTP (API) selected. 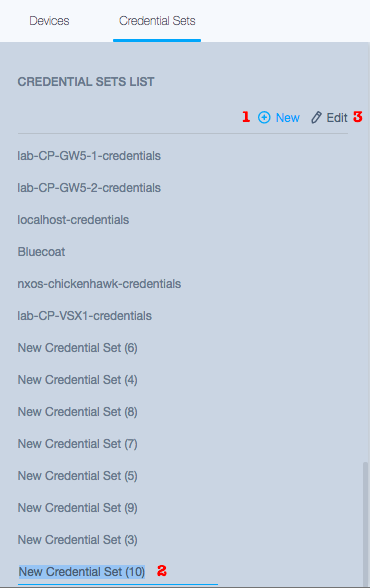 This way you do not have to enter multiple credential sets with relevant connection types and the related IP subnet for every cluster you may have. This will greatly reduce complexity and time required when adding devices to the system. Please Note: If you have devices that are not on the same subnet, but share the same credentials, we would recommend that you add the additional subnets in list, NOT create a user for each device. For ease of use it is always better to limit the number of credentials being used and instead leverage the subnet feature.